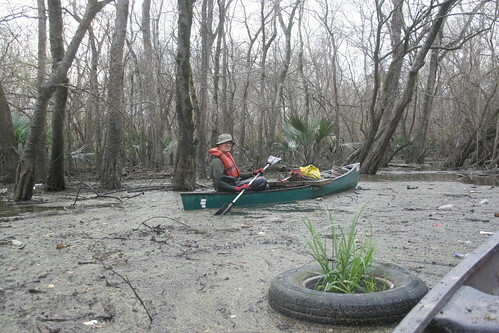 After making it through to Bayou Manchac last time, getting back there wasn’t our primary task this time. 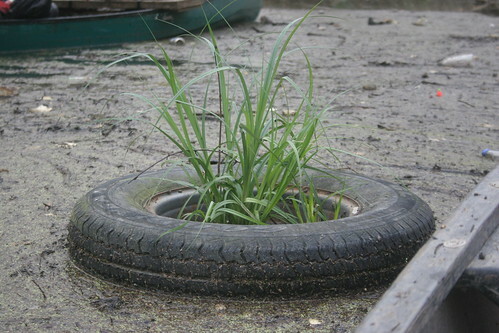 Instead, we would focus on getting everything moving on down the bayou. We arrived at the park on early and immediately went to check out the water level. According to the Bluebonnet gauge, we should have had plenty of clearance, and checking the chain gauge confirmed over two and a half feet below the T marking the bridge bottom. The water was a bit cooler than last time, reading a chilly 51°F, which is at least warm enough not to freeze your hands off while you saw underwater. You’d be hard-pressed to ask for a better day on the bayou. We launched and headed downstream, finding smooth paddling all the way to zombie blockage #11. With the water level much lower than last time out, we had pretty good access to the cause of the recent small obstructions: a very long and quite large log/trunk. We set up for some winch work and got to it. After only a couple sets, the log was free floating, and considering its significant length, we ended up mooring it to another just upstream. It should no longer cause problems, and we did not detect any other significant problems at #11 (at least at the current water levels). 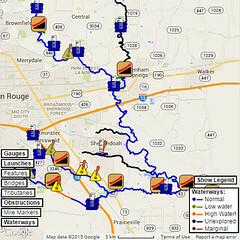 We continued downstream past the old epic #15 before finally starting to reach some unsettled flotsam. At one point we encountered a fallen tree that, looking back, we do not believe was there in October when we first scouted the bayou. That would make a grand total of one “new” fall along 4.5 miles of bayou over four or five months of work, which doesn’t seem like a rate that should cause problems. Naturally, it was an old tree with lots of finger-thick poison ivy vines all along it, and while I wear gloves, long sleeves, and so on, I seem to have let a bit of vine catch my wrist. Well, at least it’s out of the way now. The areas of collected flotsam didn’t look too good, but their bark was certainly worse than their bite, as the canoes slid right through and over them. We freed the logs or branches that were causing each, and on everything went down the bayou. At one point, just over a mile and a half from Bayou Manchac, we looked downstream to see a person in a canoe paddling our way. That was an unexpected surprise, and we had a nice chat. Apparently, that was the furthest he’d made it upstream from his place across Bayou Manchac in Ascension Parish, and we were quite happy to take credit for the improvement (and to note that we’re not quite done yet). We made it back to the park around sunset, and after carrying everything back to the cars and loading up, we headed out with a very good feeling about our progress. 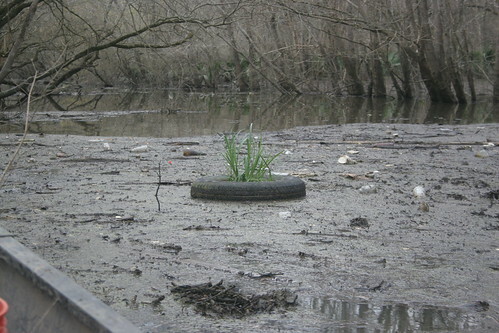 There’s not too much distance left to clear up before we can consider upgrading the state of the bayou from “passable” to “clear”, which will be the trigger for us to try to get a big group together to hit the bayou en masse for one big day of litter gathering. With a good set of paddlers, we can likely knock out the majority of the extant litter all at once, which will do wonders for the waterway. For now, however, we’ve got a bit more manual labor remaining. Until next time, then.